By now you likely know I’m an advocate for personal risk-taking in your relationships as a necessary part of building trust. If you’ve practiced what I preach, you may have found yourself in an uncomfortable spot or two as a result. It happens; that’s why we call it a “risk.” Here are three tips for what to do when your risk-taking leads to … crickets. You could let it be. Perhaps you’re generally cool as a cucumber and you know that, more often than not, people don’t respond to you simply because they’re busy. They innocently lose track or forget. You are masterful at keeping your self-orientation in check, and therefore you don’t make the absence of a response mean anything bad about you. You simply move on, confident that you’ll hear from them, or reach out again, when the time is right. I, for one, am not good at this option. I am good at pretending to let things be, all the while … stewing. You could try again. By this I mean you could re-deliver your message, perhaps with no changes or only very slight tweaks. You’re not quite chill enough to do nothing, but also not so self-preoccupied that you feel compelled to overengineer anything. You figure they just missed it the first time, so you do it over. I’m only marginally better at this option. I get caught up in worries about nagging. Besides, what if they still don’t reply—then what?! You could take an even bigger risk. Since I’m not really good at 1 or 2, and since I’m an aforementioned fan of risk-taking, you’re likely not surprised to learn I like this one the best. (c) My reach-out was horribly off-putting. 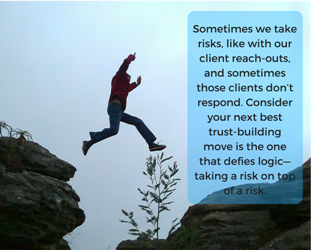 Sometimes we take risks and sometimes clients go silent. Consider your next best trust-building move is the one that defies logic—taking a risk on top of a risk. This week, look for unconventional ways to break the silence with your clients. Bonus points if anything you do includes a clever multiple choice. 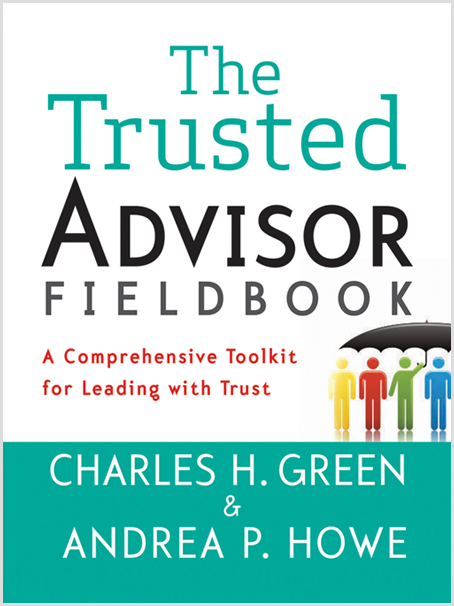 Read about the three-second rule of silence (yours), from our friends at Trusted Advisor Associates, or read about storytelling as a way to build a culture of trust in Chapter 29 of The Trusted Advisor Fieldbook.